Perennial, semi-aquatic or terrestrial herb from a slender creeping rhizome; stems erect, simple, glabrous, 0.5 mm wide, 1.5-10 cm tall. Stem leaves 5-8 per whorl, linear, unstalked, 2-6 (10) mm long, 0.5-1 mm wide, glabrous, pointed at the tips, stiff above water but limp underwater. 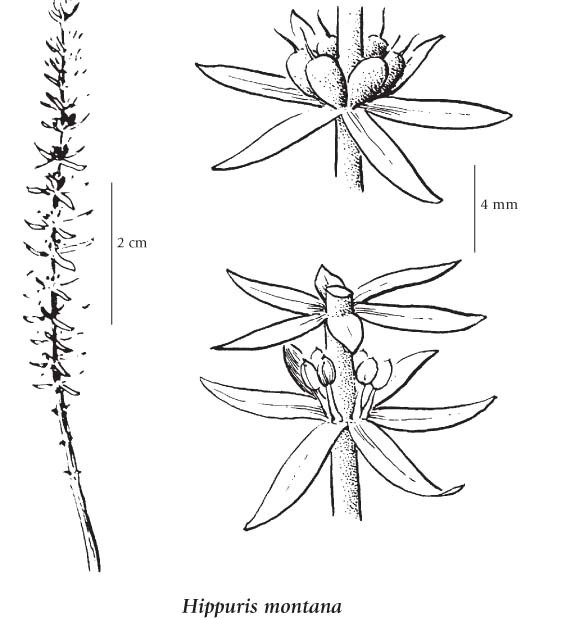 Inflorescence of tiny, single, inconspicuous, imperfect and occasionally perfect flowers in several whorls in the axils of the leaf whorls, stalked below, unstalked in the upper leaf axils, the flowers mostly unisexual, with male flowers below the female flowers; petals lacking; anthers 0.5 mm long; mature ovaries 1 mm long. Nutlets, about 1 mm long; seeds 1. Shallow streams, ponds, wet to moist meadows, streambanks and seepage areas in the upper montane to alpine zones; infrequent in coastal BC, rare in S BC east of the Coast-Cascade Mountains; amphiberingian, N to AK, YT and NT, E to AB and S to NW WA; E. Asia. A shade-intolerant, subalpine, Asian and Western North American forb distributed more in the Pacific than the Cordilleran region. Occurs in alpine tundra and subalpine boreal climates on very moist to wet, nitrogen-medium soils. Its occurrence increases with increasing latitude, and decreases with increasing continentality. Common in high­elevation, heath-like or low­shrub communities on water­shedding and water-receiving sites. 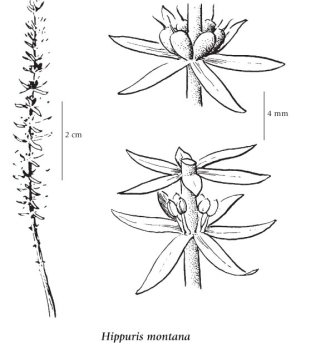 Associated with Cassiope mertensiana, Luetkeapectinata, and Phyllodoce empetriformis. Characteristic of subalpine communities.